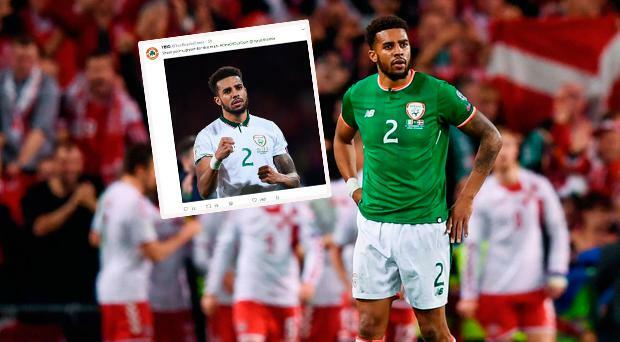 Ireland fans have come out in force to show their support for Cyrus Christie after it emerged the right full back was targeted by online trolls following Ireland's defeat to Denmark last week. Speaking at Saturday's PFA Ireland awards, where he was on hand to pick up the Overseas Player of the Year award, James McClean revealed one Ireland player was left devastated after being targeted on Twitter. "Some of the comments afterwards went beyond football," said McClean. "One player in particular was told to go and play for Jamaica. It really upset him. "That's for a player who has been a good servant to his country and it cut deep. That player was in tears by the way. You've just missed out on the World Cup and then to have that..."
There were two tweets that referenced Jamaica, one of which came from someone from England and another from what appears to be a trolling account and Ireland fans have today rallied around Christie on social media. Fans group YouBoysInGreen shared a picture of Christie with the words: "Show your support for this man. #OneOfOurOwn." The tweet gained hundreds of likes within minutes while others took to Twitter to show their support.